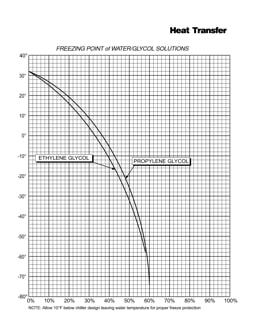 Unifrost is a fully formulated heat transfer fluid containing Propylene Glycol, a USP/Food Grade inhibitor and an additive package. Unifrost contains 96.0% propylene glycol and 4% inhibitors, other performance-enhancing additives and deionized water. It controls corrosion of metals, helps prevent scaling and fouling of heat tranfer surfaces, and buffers the pH to maintain it in the optimum operating range. Inhibitor system is food grade phosphate based. Functional equivilant to Dowfrost, Ucarfreeze, Jeffcool P-200 and can be mixed with these products with no adverse effects. Operating range of -50 degrees F to plus 325 degrees F.
Sidewalk and playing field subsurface heating. Helps prevent scaling and fouling of of heat transfer services. Buffers the pH to maintain it in the optimum operating range. It is recommended to use deionized water for dilution. However, tap water, well water, or city water may be used when it meets the quality standards. Unifrost contains ingredients that help prevent water hardness compounds, such as calcium and magnesium carbonates and sulfates, from reacting with the inhibitor/additive package ingredients to form precipitates, which can be reduce corrosion protection capabilities and can form corrosion-promoting and heat transfer limiting deposits. However, it is still recommended that water with no more than 350ppm hardness be used to dilute Unifrost concentrate or be used as make up water. Chlorides and sulfates are also usually present in municipal water sources. Both should be limited to concentrations no greater that 50ppm. Click on graph to view larger size. Corrosion in glassware of steel, cast iron, aluminum, copper, brass and solder [ASTM D 1384]. Water pump cavitation erosion/corrosion test [ASTM D 2809]. Foaming tendency test [ASTM D 1881]. Aluminum corrosion at heat transfer surfaces [ASTM D 4340]. Simulated service metal coupon corrosion test [ASTM D 2570]. Automotive and light duty antifreeze concentrate propylene glycol based [ASTM D 5216]. Glycol based engine coolant for automobile and light duty service [ASTM D 3306].